Hot off the presses, the latest issue of Coro Coro Comics revealed the identities of all eight Robot Masters for Mega Man 10. Check them out below! ....Sheep Man, Blade Man, Nitro Man, and Commando Man. Commando Man: Attacks with a powerful explosive wave. Blade Man: Attacks with three swords. Nitro Man: Can transform into a motorcycle. Sheep Man: Splits up and creates lightning strikes. Solar Man: Absorbs attacks and attacks with solar energy from his head. Chill Man: Fires an icy shot. Pump Man: Has a water-themed shield weapon. Higher quality scans are on the way, so stay tuned! Am I the only one who's reminded of Top Man when they see... I think that's... Solar Man? I had found the first picture, but not the second. Not too happy with these designs. I should reserve judgement until higher quality scans, though. I sorta wondered how this would be handled, since CoA asked the reporters to keep the names udner wraps, but I guess if you showed the scans even without saying the names, people would have figured it out quickly anyway. So... Blade Man walks into a bar. The Bartender asks. "why the long face?" Is it me, or does Chill Man bare a bit of a resemblance to Tornado Man? Sheep Man, Commando Man and Chill Man look cool but the others are all so and so. 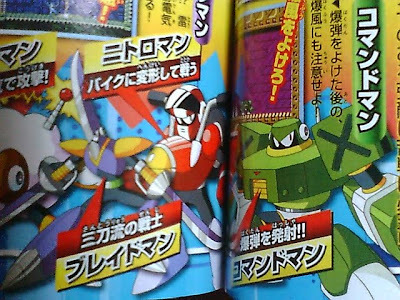 Blade Man looks kind of stupid in his art form, I thought he'd look better based on the sprite cutout in the trailer. I don't understand the disappointment. 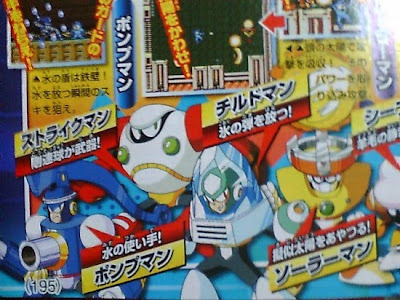 These all look like pretty solid designs to me - they fit the Classic Megaman style well enough, their names make sense (I never would've guessed SolarMan or NitroMan, but they do fit). If you're complaining about sameness - well, this is the tenth game in a series, and they've deliberately designed it to feel like a throwback to the NES titles. Of course the bosses are going to have the same feel. Or is it just that you don't have a female boss to obsess over this time? Just something about most the designs seems "jumbled up" or "uncoordinated" or... something. I actually think ChillMan and NitroMan, as well as SheepMan and PumpMan (despite their relatively silly concepts), are pretty solid designs. The others, not so much, IMO. Similarity is not an issue of mine. Since I still think R10 is supposed to be more like a "throwback" title, and as such wasn't likely to break any design precedents. And I think the "sameness" is appealing, at least it is to me. All of the characters, specifically their faces, just ooze RockMan design and I think that's what makes them look like they "fit in," but I don't think that necessarily means they are good designs. Though I won't lie, I would have liked another female boss. That would have been a nice trend idea to follow up on. But I'm not holding that against them. I'm also led to believe Inafune probably didn't have as much control over the designs this time. Oh mannnn they look excellent. I can't wait for higher quality scans! I'm especially enjoying Chill Man - based on his silhouette I thought he was going to look more like Jewel Man. His head suspended in ice? Pretty classy stuff. I like these designs. This game will be excellent. I hope the rumor of Forte/Bass being playable turns out to be true. But, remember Capcom: many fans, myself included, still want Megaman 2: Powered Up! I like it overall. Im am deeply dissapointed with Blade Man though. WTF?! With a schweet name like that how can you end up looking so stupid? Chill Man looks a LOT like Mr. Freeze XD. Blade Man is obviously made of blades. Too obvoiusly XD. Solar Man is Top Man, Pharaoh Man and Jewel Man combined, with a grill on top. EPIC SILLYNESS IS EPIC. That's the best they could come up. I LLLOOOVE THESE GUYS. Can't wait to see the sprite art. These RMs are silly in a good way. I can't stop laughing at Pump Man XD. BEST RMS EVER. "Chirudo" might just be a messy japanese way of saying Chill. Sorta like Pokemon "Purachina" or various games' "enerugi," and the more relevant example "robo" which can be taken to mean Robo OR Robot, though robot does have its own romanization (robotto). This is why there was an early discrepancy in the form of "Robotenza" instead of the more recent "Roboenza." Of course, we won't know until we see a Japanese screen of the stage select. There's also the ambiguous possibility that CommandoMan's name was meant to be CommandMan. Something else we won't be able to really confirm until such a screen comes along. Hmm...Pump Man looks like he has a Roman or Greek helmet or something. Nitro Man that can transform into a motorcycle seem like a Turbo Man style robot master (maybe Rush Cycle will return?). I feel MegaPhil's Nitro Man is more along the lines of what I would picture a Nitro Man being. But a motorcycle does make sense. Chill Man looks nice. Solar Man looks somewhat odd but interesting. Strike Man looks pretty much what a sport themed boss would look like my eyes. Sheep Man well...always looked like a sheep. Commando Man is awesome. Last but not least, Blade Man. Finally all the fan ideas of him can be put to rest. Funny how most of them involved him being purple too, lol. I think they did him justice. Pretty nice, in my opinion, but I expected more...hmmm...wonder who that third playable character is? Reading such ridiculous names,it makes me (once again) play this game on an emulator!! As much as I'm disappointed by the complexity of these designs, I then remember some RMs like Aqua Man and Yamato Man, then I don't feel so bad. Still, though, did Keiji just relinquish control and coordination of the designs? I though TornadoMan's insignia being on his helmet AND chest was a bit much, but these...these look like they should have been in EXE. Where are the different heads? AWEsome they just need to announce Bass as playable to make this game perfect. Try to troll with something diffrent this time. The "emulation" story is old. Am I the only one who though there should be a Django cameo in Solar man's stage? I don't know if I want that. I personally like the designs for Strike Man, Sheep Man, Nitro Man, and Commando Man because their overall body feels cohesive. Pump Man should get rid of that protrusion from his chest if he has a buster-type arm. Chill Man seems awfully serious for someone who's supposed to be "chill" (I would've preferred a Heat/Dynamo Man type face). Solar Man's torso seems a little generic, but I think he'll grow on me once I get used to him. Blade Man is passable, but the pose seems really bland with his arms spread out. Squished together, the robot masters seem too colorful and messy as a group, but they'd probably stand out more given more space. We get it. You're a troll. Now go back and crawl under your bridge. Overall, I like the designs. Pump Man looks retarded, but I don't hate it. Odd. Interesting. PumpMan look a lot like DiveMan and SolarMan like TopMan. I honestly don't know what to say about BladeMan.... he looks... just.... uh, yeah. Im not personally overly all that pleased about NitroMan.....mainly because my personal Rockman/MegaMan fan fic that ive been working on the past 2-3 years or so is called MegaMan Nitro. I don't really want to now have to fit in a "NitroMan" in there, or feel like its now a rip-off.